The Best Dairy Free Chocolate Cake is everything that you wish for in a cake. Moist, rich, and of course super chocolatey. Paired with our dairy free chocolate frosting for an absolute treat. 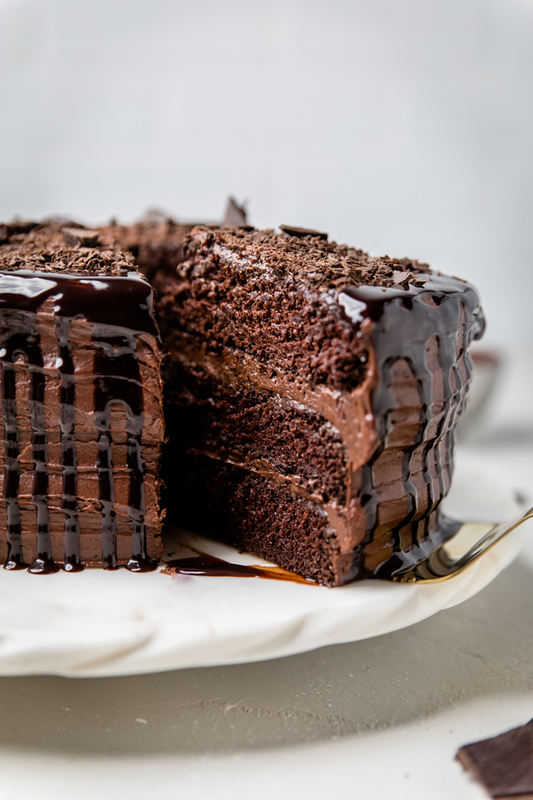 Chocolate cake is the way to so many people’s heart. When you are vegan or dairy free, that’s no exception. 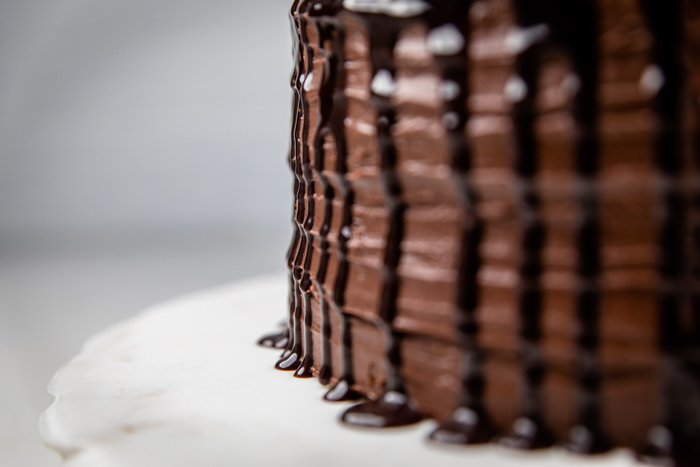 You still want to indulge on a delicious chocolate cake every once in awhile. You’re in for a special treat because we have the absolute best dairy free cake for you. 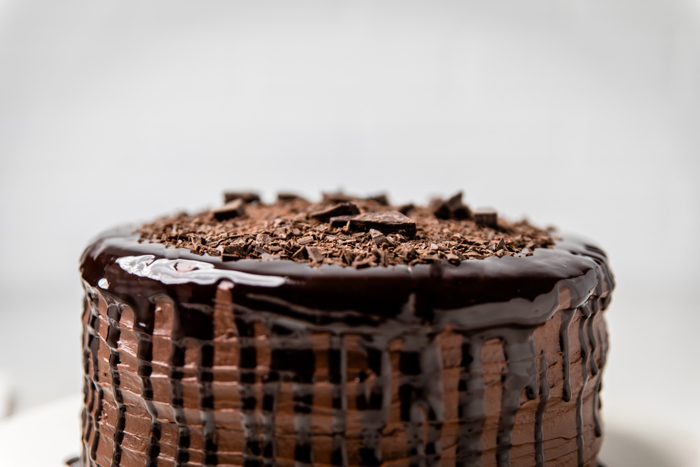 And while we may be a little biased, we’d venture to say it’s even the best chocolate cake period. Listen, this dairy free chocolate cake is so good that you wouldn’t even realize that it’s a completely vegan chocolate cake. You won’t miss the milk or eggs at all. Move over death by chocolate cake. And get out the way better than s*x cake, because this dairy free chocolate cake is everything you’ve dreamed of and more. This is a vegan chocolate cake, which means there’s no dairy or eggs. However, we also describe below how you can make this a gluten free, vegan cake as well. Win. Win. 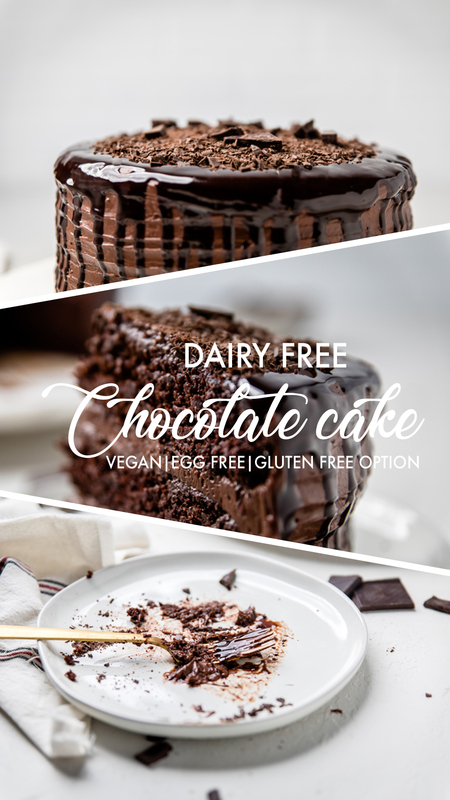 What ingredients do I need to make a dairy free chocolate cake? 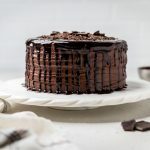 How to make a dairy free chocolate cake? 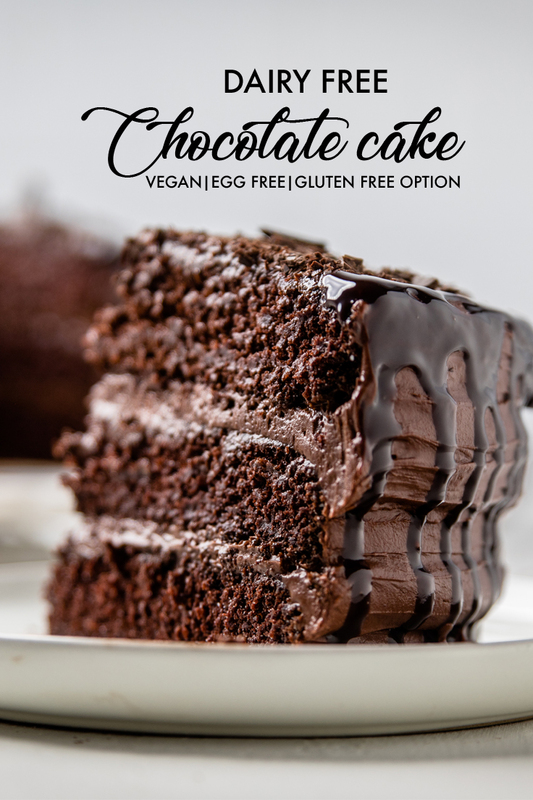 Because we are making this dairy free chocolate cake also a vegan chocolate cake, we need to make this cake without eggs. In order to do that we are replacing the typical milk or buttermilk in a regular chocolate cake recipe with almond buttermilk. For the eggs, we are doing a combination of applesauce, baking soda, and apple cider vinegar. Once we had the replacements we needed to make this dairy free chocolate, we were ready to bring you the most delicious dairy free cake ever. In one bowl, you’ll combine all the dry ingredients by sifting them into the bowl. Then, you’ll make the almond buttermilk and let that sit up. In another bowl, you’ll add all the wet ingredients, except the coconut oil and additional almond milk. Add the dry ingredients to the wet ingredients with a mixer on low speed in four increments, just until blended. In a small saucepan, bring the coconut oil and almond milk to a boil. Pour that in and stir to combine. Let mixture sit for 5 minutes. Grease 3 9″ pans and evenly pour batter into each one. Bake at 350 degrees for 28-32 minutes or until a toothpick inserted comes out clean. Remove and let cool completelyBake in oven 28-32 minutes or until toothpick inserted comes out clean. 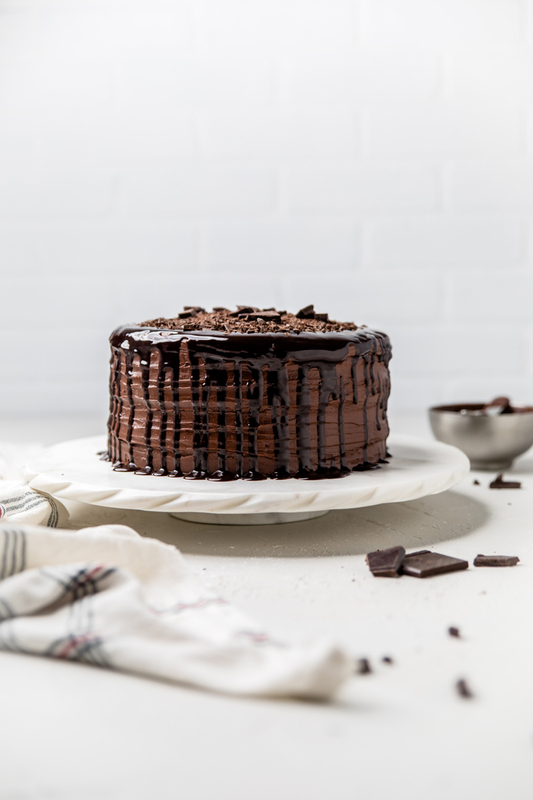 See below tips and tricks for making this dairy free chocolate cake perfect! 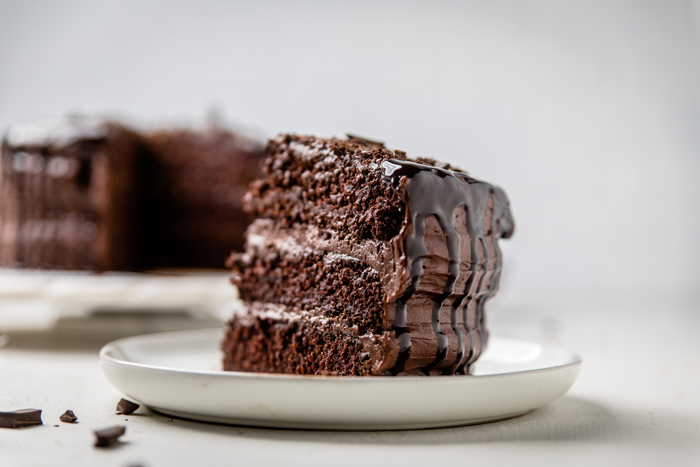 How to make a moist dairy free chocolate cake? Sometimes people hear vegan chocolate cake and get paranoid. They think it’s not going to be as good as a “normal” chocolate cake recipe. But, we beg to differ. This dairy free chocolate cake is rich in chocolate while still remaining moist. In order to have the divine milk free chocolate cake recipe is in the ingredients. The right amount of fat (coconut oil) combined with making our own almond buttermilk (acid) and adding in leavening agents (baking soda and baking powder) all act together to insure this will not be a dry dairy free chocolate cake. Also, the importance of minimally processing the ingredients together. We only mix until combined. We do this because the longer you beat flour, the more gluten forms making for a not so great cake. Can I make this into dairy free chocolate cupcakes? You can absolutely make this into dairy free chocolate cupcakes. 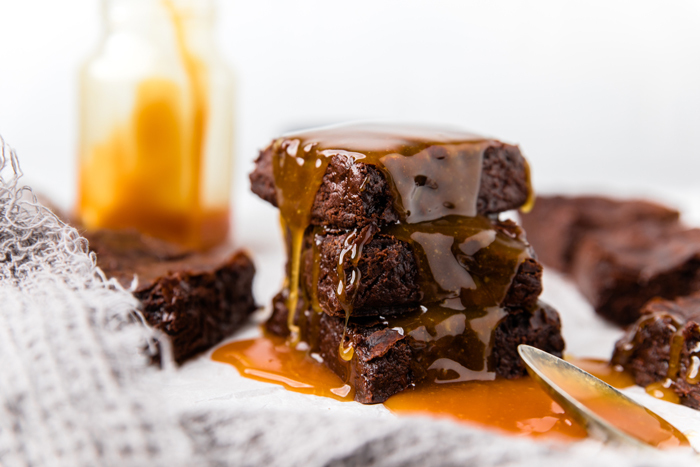 Simply make the recipe as normal and then instead of greasing cake pans, spray a cupcake pan or liners. Fill each one up 3/4 of the way. You’ll want to reduce the cooking time to 15-20 minutes. What is the purpose of the dairy free “buttermilk”? By adding some acid to your batter, you are creating a dairy free cake that is moist and delicious. It helps to break down the tough gluten strands, yielding in the most delicious dairy free chocolate cake recipes. Don’t skip this step! What does it mean to bloom the chocolate? When you get to the step about boiling the almond milk and coconut oil together, you may be tempted to skip that step, but don’t. 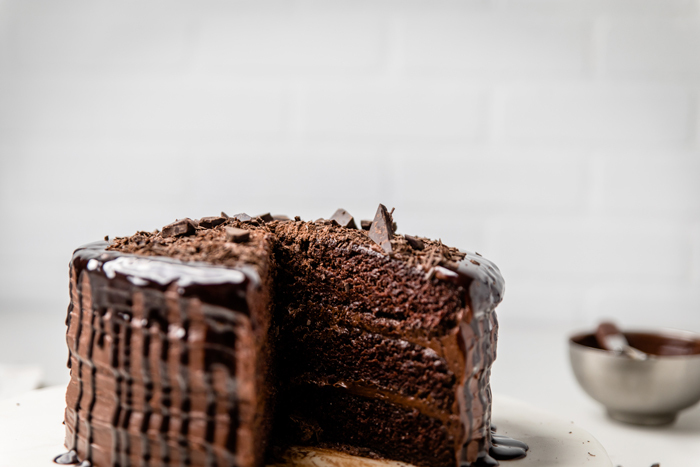 It’s very critical to do so in order to make this perfect dairy free chocolate cake. You add the boiling milk mixture in order to help the cocoa power “bloom”. 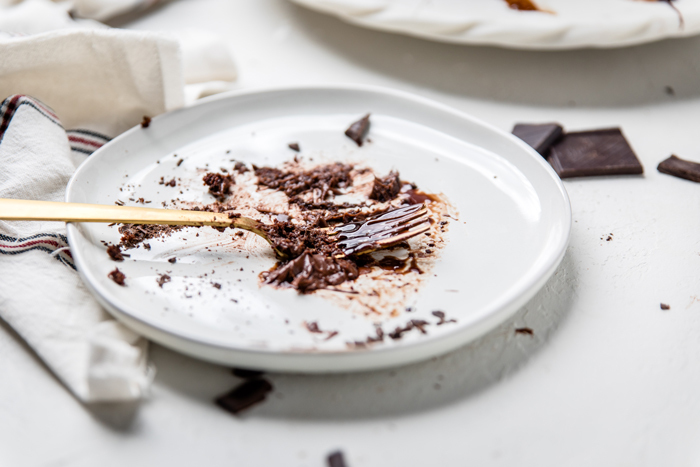 When cocoa powder it mixed with a hot liquid (you can do this with water, coffee, milks, etc) it allows the powder to dissolves and release flavor particles. Essentially, it brings out all the flavor in the cocoa powder, ensuring you have the best dairy free chocolate cake ever. I’m dairy free but not vegan, can I just use eggs in this dairy free chocolate cake? You could definitely swap the applesauce for the eggs in the recipe if you are not wanting a vegan chocolate cake. You would want to remove the applesauce entirely and instead use 4 whole eggs when making the wet ingredients bowl. Can I make this a gluten free dairy free chocolate cake? Absolutely! Did I just make your day? You can swap out the vegan all-purpose flour for Gluten Free Cup for Cup flour. You can also swap out the cake flour with a gluten free version. All the other ingredients that we use in this recipe are naturally gluten free and no swaps are needed. What if I don’t want to make a 3 layer vegan chocolate cake? 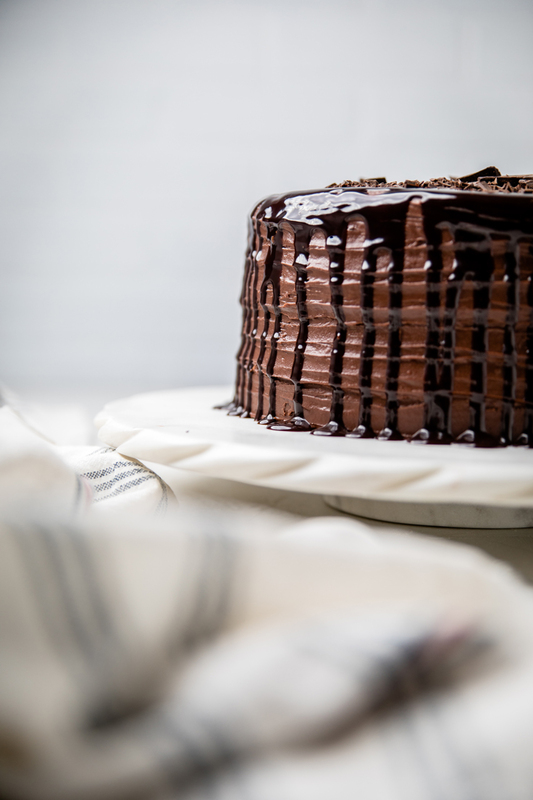 A vegan three-layered chocolate cake sounds dreamy for your next big celebration or get together. It can go a really long way if the pieces are cut thin. However, we know that not everyone needs or desires to make a 3 layered dairy free cake. Fortunately, we have great news! You don’t have too. This dairy free cake can be frozen allowing you to only make one layer, two layers, or all three layers. If you don’t want to make this a three layered dairy free chocolate cake, make the recipe as instructed for all three layers. Then, when the cakes are cooled to touch but still slightly warm, remove from the pans and wrap them with plastic wrap. Wrapping them while warm allows the moisture to continue to stay inside the cake and not be dry. Place in freezer for up to 6 months. When you are ready to use another layer (or two), remove cake from the freezer and discard the plastic wrap. Let the cake come to room temperature. Use as desired. 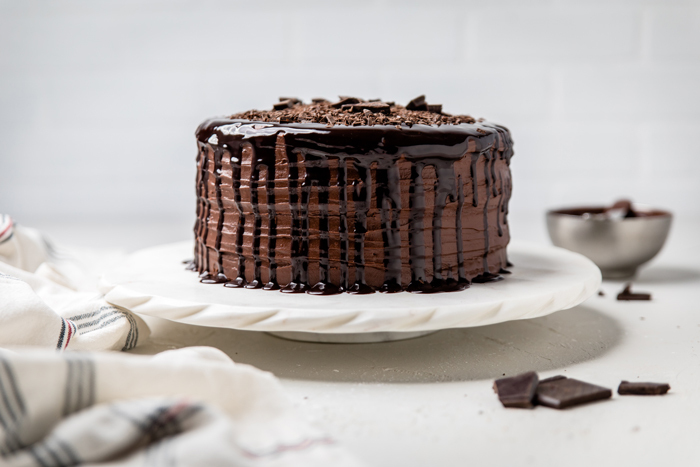 How can I frosting this dairy free chocolate cake recipe? 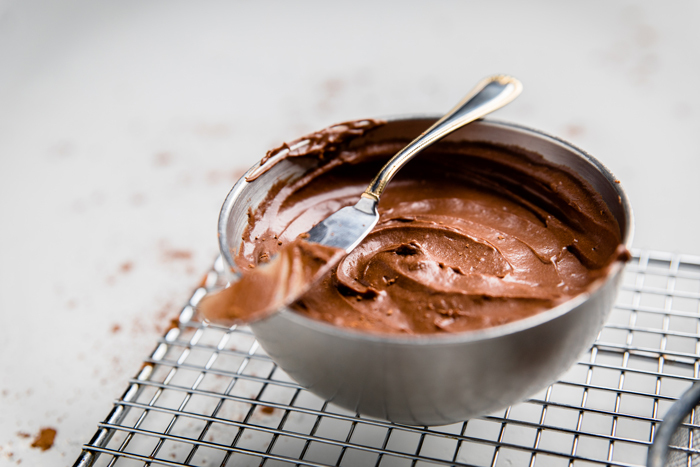 We highly recommend use our dairy free chocolate frosting recipe. How do I make this dairy free chocolate cake look exactly like yours? We get it. No one likes “Pinterest fails”. You see something and think, “that’s out of my league, no way I’m trying that.” Take a deep breathe and instead say, “I’m going to following these steps and make the best cake I’ve ever made.” Step 1: It’s all about positive thinking. 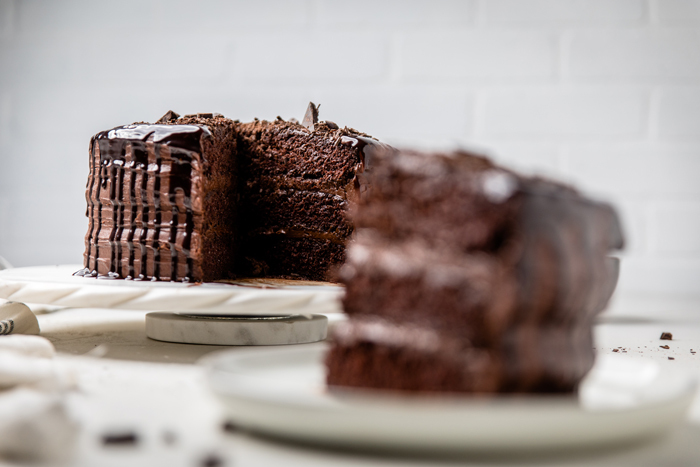 Step 2: You need to follow some really important tips that we’re going to share with you on how to make the best dairy free chocolate cake that actually looks like it came from a bakery. Your guests (and yourself) are going to be blown away. Follow the instructions pretty please. Cake baking is a science, especially when making a dairy free/vegan cake. The sifting and exact ingredient amounts are very important, as is the boiling and letting the mixture set. Every step has a purpose to ensure the perfect dairy free chocolate cake. Make sure that you evenly distribute the cake batter into the three cake pans. You can use a scale to make sure that they are all within a small range of each other. When the cakes are cooked, remove from oven and place on a cooling rack to allow the cakes to cool evenly. Let the cakes cool to touch, then remove them carefully to wax paper to cool completely. DO NOT RUSH. Let it cool completely. When ready to make the cake – use a cake leveling tool to make sure there’s no even tops. Place a small amount of frosting down first on a rotating cake stand, then your first layer. The frosting acts as a glue so the cake won’t slip. Use a piping bag and a large round tip and pipe frosting in a circular motion from the outer edge completely in to the middle. Use a cake spreader to gently even out layer of frosting. Place next layer and repeat step 6. Place third layer on top. Step back and see if there is any gaps in between the layers. If there are, place enough frosting in those areas to get frosting to the edge of the pan. Use a cake scraper to go around the cake and ensure evenness around the entire cake. This step is really important. Place frosting on the top of the cake and more on sides if needed and frost evenly. Using a spreader on the top and the scraper to even evenness. Get creative. 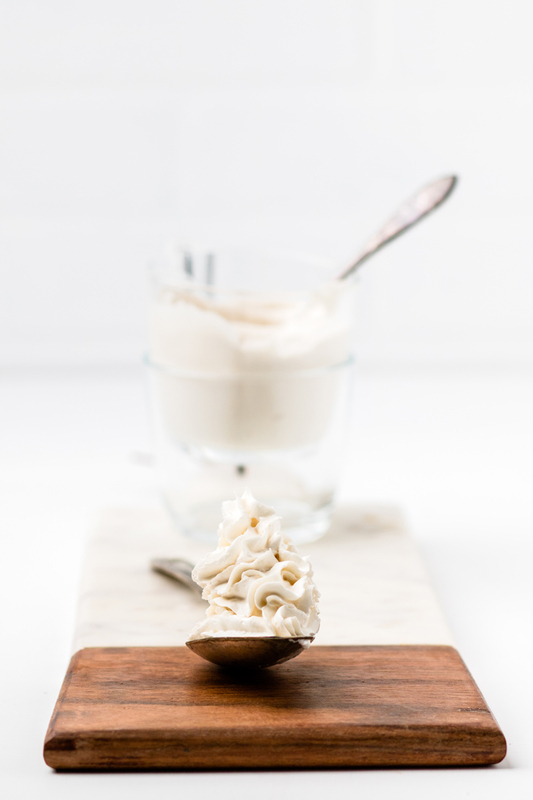 If you can’t get as smooth as you want or even as you want – you can also add toppings like crushed nuts or chocolate shavings, or drizzle chocolate syrup along the edge so people focus on that. Plus it looks better either way. *Bonus Tip: If you want to frosting the cake but keep a clean cake stand, cut four 7″ pieces of wax paper and overlap them before placing the first layer on the cake stand. When you are completely done frosting the cake, carefully remove the four pieces of wax paper. What are other dairy free chocolate desserts I can make? Grease 3 9 inch pans with coconut oil very generously on bottom and sides of pan. Set aside. In a large bowl, add the applesauce, maple syrup, apple cider vinegar, vanilla, and curdled almond milk after it has set for 10 minutes. Beat on low speed just until combined. In a small saucepan, add the remaining 1 3/4 cup almond milk and coconut oil to a small saucepan. Bring to a boil. While waiting for the almond milk mixture to boil, in 4 parts, mix in the dry ingredients to wet ingredients on low speed. Just until blended. DO NOT OVER MIX. Once boiling, remove almond mix mixture from heat and pour into chocolate cake bowl. Using a spatula, fold in just until combined, scraping down any mixture if needed. Let bowl set for 5 minutes. While waiting preheat over to 350 degrees F.
Bake in oven 28-32 minutes or until toothpick inserted comes out clean. Remove from oven and place on a cooling rack. Once cool to touch, carefully remove and place on wax paper. Let cool completely. Do not rush this part. Frosting cake one layer at a time. *See tips above. Add any optional toppings – some ideas would be chocolate shavings, fresh berries, coconut flakes, or chopped nuts like walnuts or peanuts. **Nutritional facts are just estimates. Please utilize your own brand nutritional values to double check against our estimates. Nutritional facts do not include chocolate frosting. THIS DAIRY FREE CHOCOLATE CAKE IS SO GOOD, THE PLATE WILL BE CLEAN! I would like to be your recipe taste tester from now on, mmk? YUM – this cake looks incredible!